In third grade I went to Guadalajara, Mexico to visit my family there. Few nations enjoy the King of Pop more than Mexico. So while I was there it was the peak of the Thriller phenomenon. We were walking around in the streets shopping when I saw all these little kids wearing the Thriller jacket and the Beat It zipper jacket. I HAD to have one. 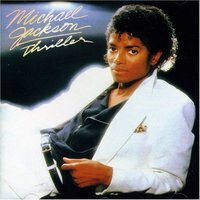 Let the mass hysteria begin- it's official, Michael Jackson died today from a heart attack. When it was earlier reported that the King of Pop was hospitalized, I have to admit, I wasn't moved one bit. Michael has used the "sick card" before so I blew the news off as a publicity thing. As much as I love his music and having been a fan a s a child, I have come to be a bit skeptical when it comes to the rumors surrounding the eccentric Jackson.